300 pages | 3 B/W Illus. 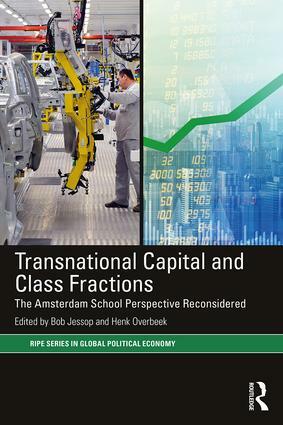 Emerging in the late 1970s, the Amsterdam School’s (AS) most distinctive contribution to international political economy was the systematic incorporation of the Marxian concept of capital fractions into the study of international politics. Contending that politics in advanced capitalist countries takes place in a fundamentally transnationalized space in which the distinction between ‘domestic’ and ‘international’ has blurred, it shows how in this space, politics is structured by competing comprehensive concepts of control. Presenting a concise and instructive introduction to the origins, development and significance of this distinct approach, this book provides a unique overview of the School’s contemporary significance for the field. Offering a new generation of critical scholars the opportunity to become acquainted at first hand with some of the contributions that have shaped the work of the AS, the contributions present critical commentaries, discussing the merits and shortcomings of the AS from a variety of perspectives, and undertake a (self-) critical evaluation of the current place and value of the AS framework in the broader landscape of approaches to the study of contemporary capitalism. Written for scholars and students alike, it will be of interest to those working in international political economy, international relations and political science, political sociology, European studies and branches of academic economics such as regulation theory and institutional economics. 16 The Amsterdam School: Gender as a blind spot? 19 Network analysis and the Amsterdam School: An unfulfilled promise? Bob Jessop is Distinguished Professor of Sociology and Co-Director of the Cultural Political Economy Research Centre at Lancaster University. Henk Overbeek is Emeritus Professor of International Relations. He has taught international relations and international political economy at the Vrije Universiteit Amsterdam since 1999.